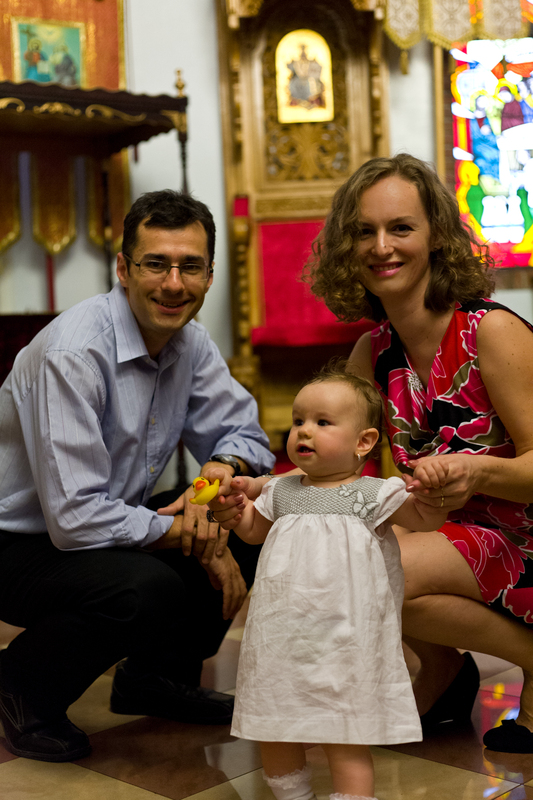 Photos from 2012 at Sonia’s Baptism. She is 2 years old now. 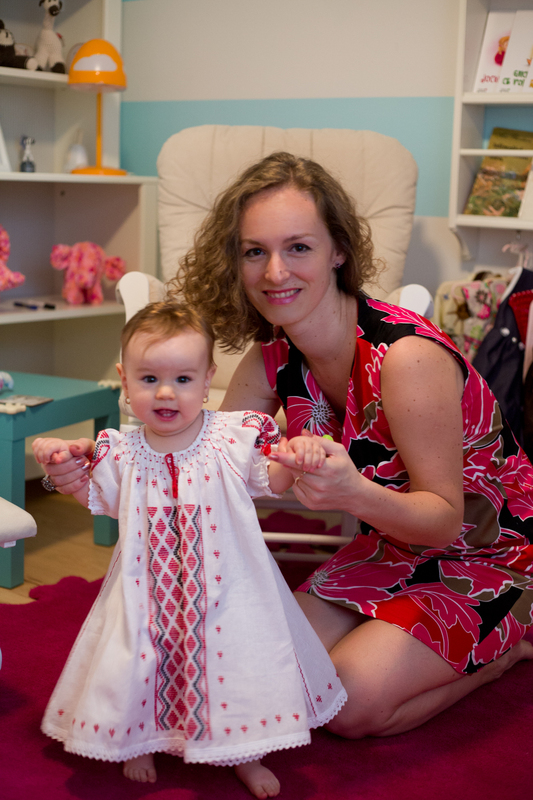 The dress is made out of cotton sateen based on the same La Mia Boutique Pattern. Sonia is wearing a traditional Romanian dress made by grandma with hand stitched embroidery. Friendly to nature, originally uploaded by fmirela. Eco friendly fabrics from JoAnns! The best part about that is I can use coupons for 50% or 40% off, so the price is way better then online. I have searched forever for some simple buttons to use and after looking at a few priced over 5$ I have finally found these geometric wood buttons for .50c 🙂 they go with the eco friendly. Finished the insides with a simple satin ribbon with a honey comb stitch. 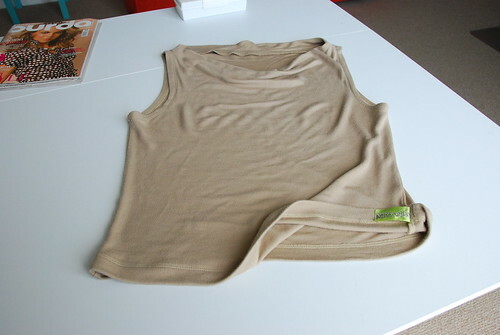 It will keep the raw edge from fraying and it adds some appeal without being bulky. The Golden Label, originally uploaded by fmirela. 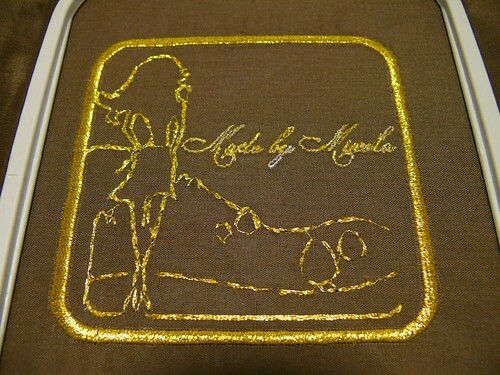 Digitized and embroidered logo, using Brother HE 120, with Sulky metallic thread and a special needle for metallic threads. I have to work more on embroidering text using script fonts that have been shrunk . 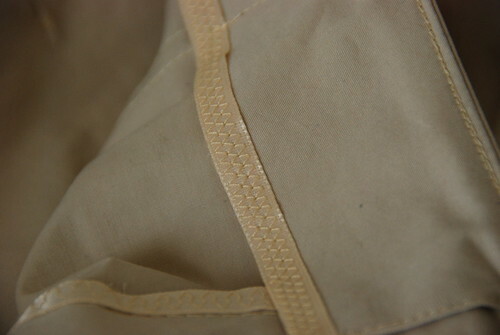 The satin frame is done separately without removing the fabric from the hoop. I have cut around the border and this is now hand sewn to the back of my Jeans Jacket, on the underside. 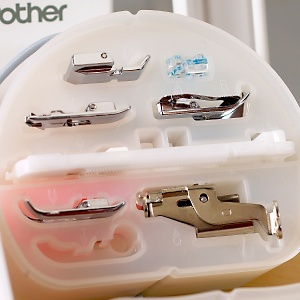 My new Brother Sewing Machine, the HE 120 has arrived last week and since I have been looking for supplies for embroidery, like thread and stabilizers. I’m loving it so far, still have a lot to learn about embroidery. I have realized how important the combination of fabric, thread, needle, tension and stabilizers are. I need to come up with designs, and I have a few in my plans. I was thinking of the Azaleea dress from BurdaStyle with embroidery over the placket, an embroidered tunic, folk style. What i would like to try is free motion embroidery, and I’d like to create some wall hangings on linen with black or brown thread, representing pictures of Cluj, my home town. Something similar to sketches, but made my needle and thread, with the help of HE (HE is my Brother HE 120). Yeay! I’m so excited! 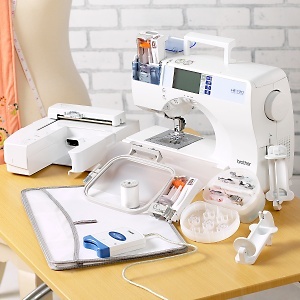 I have just completed my order of a brand new sewing/embroidery machine! 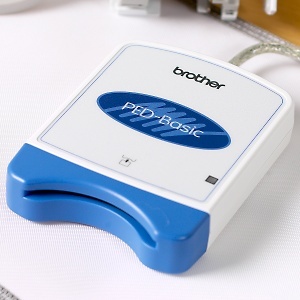 Brother HE 120, I have found it at HSN Home Shopping Network online store, it comes with the PED Basic software and memory card writer, so I can download designs and create my own. But really, are we in 2008?? I can’t believe how Brother is selling us a 4MB memory card on a proprietary memory card type, instead of a simple USB port or a regular SD card, and 4MB? LOL! I mean come on! this technology has been out there for so long, I’m sure it would be easy to just incorporate it into the machine, it should not be so pricey. Not only grandmothers that are oblivious to the present are sewing. And even some of them know what memory is and how available it is for computer usage. We know this is not worth so much, it’s just that there aren’t that many choices out there and it is all about marketing and a more limited market… unfortunately…. Look online for coupons if you decide to buy from them, I got a 15% off as this was my first buy from HSN. Why I did not go with Singer? After all, I have their Quantum Lock Serger. I also had another serger from Singer, the cheaper one, and I returned it immediately. It was noisy, unstable: really moved off my desk, slow…well… I read mixed opinions about the Futura, which can connect to the computer directly through a cable, did not like that much the decorative stitches, nor the buttonholes (just 2 kinds compared to 8 or 10 from Brother). Some said that the software was not compatible with their computers, got pour customer service, others said it gives constant error messages, and that it is harder to fix problems and you spend more time on that instead of embroidering. Others were very happy with it, others had to return it. So I was really afraid to go that way and miss out on what I have now with my current machine. I really wanted to keep the functionality of my current Brother CS 8150 that I really love a lot. 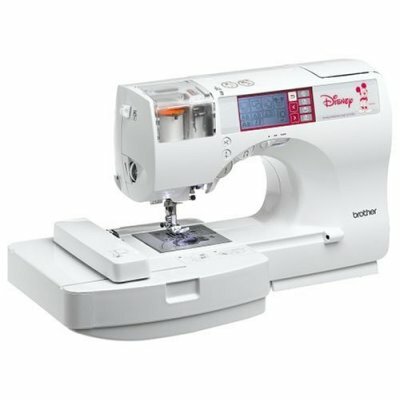 The HE 120 seams at first sight very similar to the SE 270D that Disney Embroidery machine from Brother, except the SE does not do so many things. 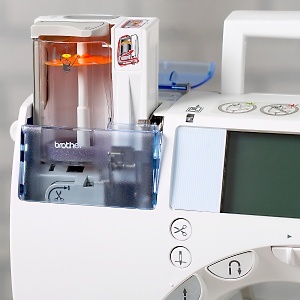 Also I was considering the PE 700 II that was a USB cable and can connect directly to a computer and has a larger hoop, but that is double the price and just an embroidery machine, lacking all those goody utility stitches. 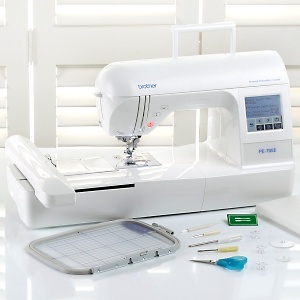 Also PC 420 the new Project Runway limited edition features are already included in the HE at a cheaper price, plus this HE embroiders from the card! Might have a better/safer threading system. Has more decorative satin stitches. Speaking of utility stitches, so far I have not used all of them of course, but I do like the flower borders and the idea of sewing cross stitches and satin and other decorative stitches. 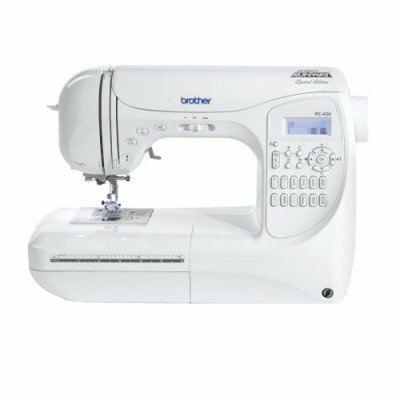 I am only upgrading because I’m curious about the embroidery part. What am I going to embroider thought? I have no clue yet, names, borders, the possibilities are endless, but I will try to use it for clothes, more then home design. I would like to have my custom labels to sew on my creations, also make custom gifts for special occasions. My dear machine is going to be for sale 😦 in case I’m going to fall in love with this one, after it arrives. She has served me well and I will always love her. We never-ever argued or fight no matter what I asked from her. Opinions, suggestions, other options, experiences, what do you think?